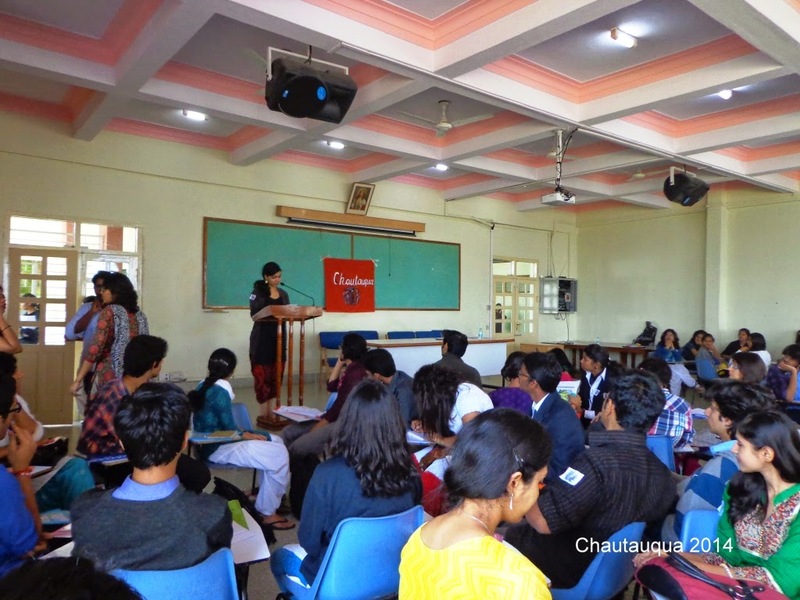 The 'Chautauqua intercollegiate poetry workshop conducted on the 30th of January in the Assembly and Conference Halls of Block 2, Christ University campus began with a formal inaugural ceremony, at 9:15 am soon after the registrations for participants closed. The dignitaries on the dais were Dr.Kennedy, dean of Humanities and Social sciences, Professor Shobana P. Mathews Coordinator of MA English and Father Joseph from the Mathematics department, Coordinator of the department of English and Media Studies. Shifa Rehman from the Reading poetry class was the emcee for the formal event while Shyam Nair took on the role of emcee for the day. The workshop officially began with the participants being divided into groups of 7 to 10 each. Next an ice breaking session was underway. Every member of the team had to contribute two lines to a poem that the group was to collectively come up with and one member from each group read out their respective poems to the audience. Following this activity was the tea break after which the events lined up for the day began. Registrations for events took place a little prior to the start of the event. Members could decide who would take part in what event during the tea break. The first event was verse in Verse where in participants had to come up with ways to complete a poem given to them on the spot by filling in alternate lines. This was a stage event and a presentation was used. We had 14 participants in all for this event. 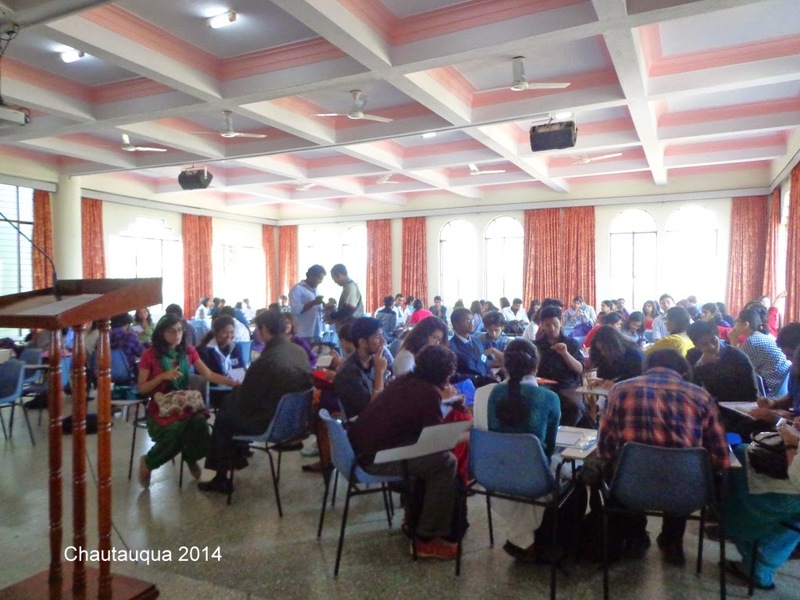 Simultaneously, the 'sense poetry event was taking place in the conference hall. Here the members were asked to write poems after being exposed to a variety of stimuli that were to have an effect on all five senses. Following this event, 'Poetry palette' took place at the same venue. In this event, students were given postcards to write Haiku on and illustrate the same. Meanwhile 'mime the rhyme' took place at the Assembly hall. For this event students came up on stage in pairs and as one person recited the poem, the other acted it out simultaneously. Soon after this the lot broke for lunch following which the event 'Sell out!' Marketing with poetry took place. Here, participants came up with rhymes and jingles to sell the objects given to them. After this the gathering broke for tea and snacks. Epic spoof, the main event for the day, took place when they reassembled. Extracts from epics (randomly chosen) were distributed at the start of the day and groups were expected to present them in innovative ways. The valedictory of the workshop involved a series of poetry readings by regular and other members of the Chautauqua circle of poets. We had readings by Tarun Surya, Andrew Cora, Shobana Mathews, Shyam Nair, Stuti Gupta, and many others. Then, we had the announcement of results and formal distribution of prizes by the Judges for the day, Prashanth and Nicco, the best poets of last semester’s Chautauqua. They spoke to us about the importance of form in poetry and emphasized that the beauty lies in not what is being said by the poet but instead, on the manner in which the construction is made. The vote of thanks was delivered by All in all, Chautauqua 2014 poetry workshop was a successful attempt at rediscovering, redefining and exploring our notions about poetry in the present day. Dr. V. Shivaraman, M.A., M.Phil., Ph.D., is an Associate Professor at the Department of English, Presidency College (Autonomous), Chennai. His doctoral research was centred on the plays of renowned Kannada playwright Girish Karnad, and he has published several scholarly articles and books on Indian theatre. Dr.Shivaraman is also visually challenged and has held several honorary positions with organisations working for the welfare of the differently abled. Dr. Shivaraman primarilyargued that certain playwrights in post-independent India made an “earnest attempt” to “nativise” Indian theatre. While making a special reference toKarnad, he also noted playwrights such asHabib Tanveer, Chandrashekhar Kambar, Vijay Tendulkar, Mohan Rakesh, Mahesh Elkunchwar and K. N. Panikkar for their endeavour to nativise both theatrical content and form by wresting them from colonial influences.He excluded certain figures from this distinctioneither on the grounds that they wrote in English (e.g. Mahesh Dattani) or that they merely nativised themeswhereas their characters spoke like the British (Rabindranath Tagore, Aurobindo Ghose, etc.). The speaker commenced by emphasising the needto read plays not simply as written texts but more comprehensively as performances/productions. Moreover, he stressed the significance of approaching Indian theatre with the aid of Indian theoreticians(such as Aparna Bhargava Dharwadker) as against the Western-oriented theories typically employed for research in English Studies. Thespeaker then drew the audience’s attention to the paradigm shift in recent times from the category of “Indian writing in English” to more inclusive areas such as India Studies, regional literatures, Indian literatures in translation, etc. He situated this shift within the larger movement to a post-theory era of Cultural Studies and specifically applied it within Indian theatre by identifying the post-Independence shift fromindiscriminate imitation of Western drama to substantial attempts at nativisation. In this regard, he also remarked that India no longer worships English as an icon but instead treats it as a weapon against colonial strategies. Thereafter, the speaker explored various sources through which India’s pre-colonial past could be reclaimed in theatre.For this purpose, despite problematising classical sources (concerns around the hegemony of Sanskrit)as well as folklore (folk forms,e.g.yakshagana, koodiyattam, tamasha and nautanki, survive only in the oral tradition, and are not documented), he stronglyadvocated the need to revisit them for nativisation, especially folklore, since it remains completely insulated from colonial ravages. Healso proceeded to demonstrate how despite being politically irreconcilable, there exist cultural/theatrical similaritiesbetween these forms, e.g. anti‑realistic performances and stylisation found in both classical texts and folklore, though executed differently. The speaker then went on to quote Dharwadker in espousing the idea of many regional Indian theatres that are “linked intra-nationally by complex commonalities and mutual self‑differentiations.” Hefurther argued that such commonalities are not superimposed but in fact inherent in these theatres, e.g. they all start with an invocation and end with a kind of benediction. The speaker also opined that theatre is one of the key spaces in India where artists can respond to politics (not to be confused with politicising theatre). Lastly, the speaker discussed how playwrights that attempted nativisation responded to both the commonalities and peculiarities of Indian theatres and emerged with a syncretic theatre that mingled folk forms with Western proscenium stagecraft through transcultural appropriation. With specific examples from Hayavadana and The Fire and the Rain, he further illustrated how Karnad is able to balance these seemingly incongruous patches, and appears to be at once fiercely anti-colonial and, paradoxically, slavishly colonial. The speaker also noted how despite invoking myths, Karnad is vehemently anti-backwardness, anti-caste and anti‑feudalism. He concluded with the assertion that the process of nativisation of Indian theatre is at its core a search for a theatre of the roots and a pan-Indian identity through eclecticism. The lecture was followed by a short interactive session during which the speaker responded to the audience’s questions and observations. 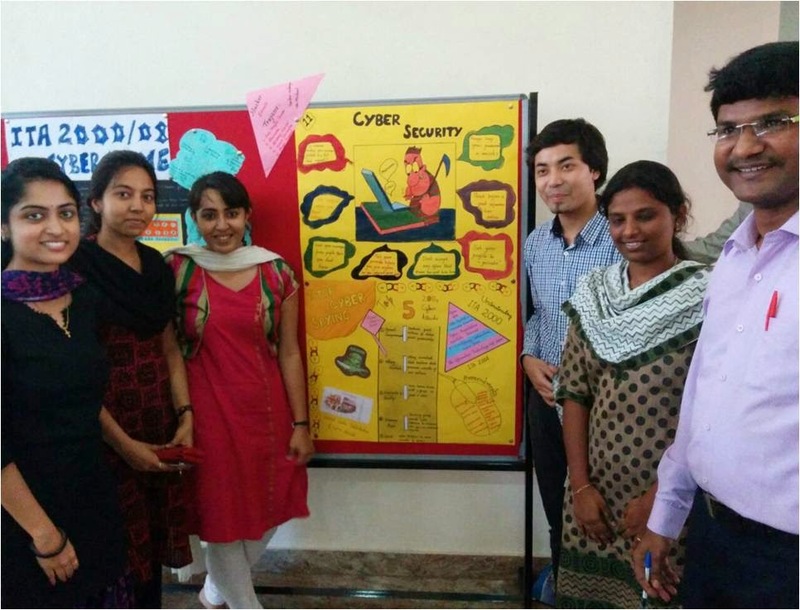 The 3rd semester MTech Students (3MTPS, 3MTSE, 3MTCN, 3MTMD, 3MTCS/IT) presented different posters as a part of cyber security awareness program. Cyber Security is a subject offered by the Dept. of CSE. 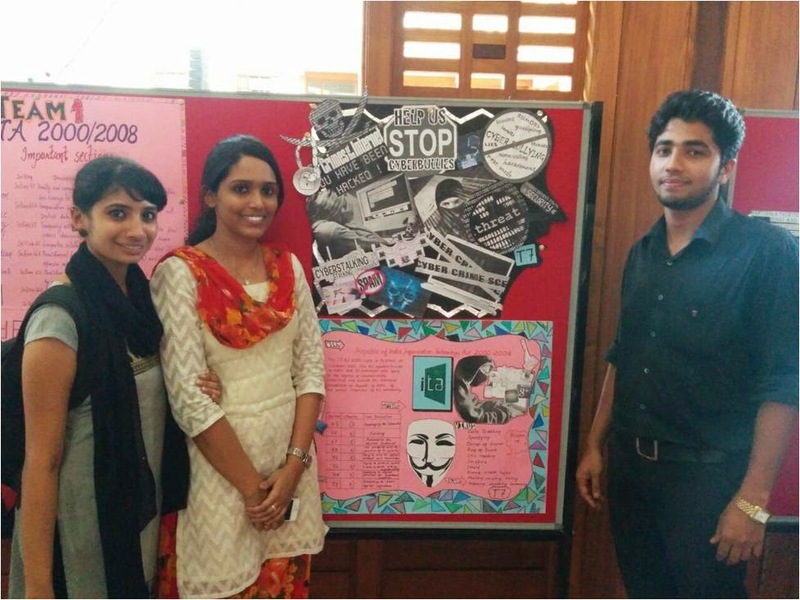 The posters were displayed on the notice boards in the foyer II Block, Christ University, Kengeri campus on September 15th 2014. The topics displayed by the students were Information Technology Acts 2000 and 2008, different sections available in it under cyber laws, India and also showcased various cyber-attacks with corresponding counter measures. This event received a good appreciation from all the departments’ students as well as faculty. The coordinators for the event were Prof. K Pradeep Kumar and Prof. M Moses. A lecture on Revisiting Indian Epics was held for the Honours in English Studies as well as 3 MA English students in Room no. 613 in the Central Block of the University on Saturday, the 5th of July with Prof. Gaana J. of the English Department as the facilitator. 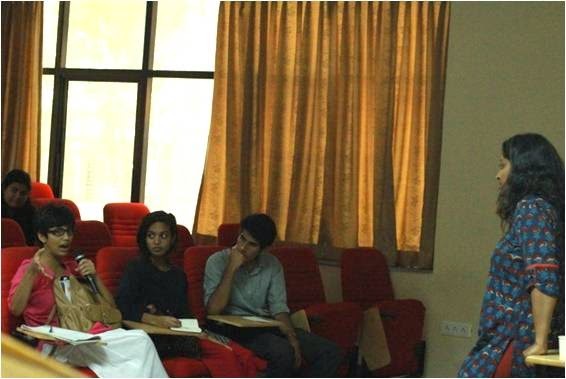 The speaker was Dr. Meera Baindur, Associate professor, MCPH, Manipal University. The Mahabharata, Ramayana and the characters in them are household names for almost every Indian. In this, Dr. Meera Baindur was no exception. However, her interest in the epics led her to read the Sanskrit classical versions. After the brief introduction to her engagement with the epics, Dr. Baindur spoke about the difference between an Itihasa and a Purana. ‘Iti’ ‘ha’ ‘asa’ literally translates to ‘thus indeed (it) was whereas a Purana means old/ revealed. Till sixth century, the epics were transmitted through oral literature. The Indian Epics are so intertwined with Indian culture that they are seen as history by many while others see them as texts. During recitation, any one mistake can get repeated across every retelling. Dr. Baindur related how critical editions are not ‘original’ as such, but work through a system of elimination across varying accounts taken from different geographical regions and specific to culture indigenous to said regions. Again, she reiterated the fact that most of our history and culture is lost to the ravages of time due to its oral nature. Because the folktales and other stories as such can be modified according to the situations in which they are spoken, in order to suit the speaker’s needs, one is faced with multiple versions not quite knowing what ‘really’ happened. To emphasize this point and engage the listeners in an active discussion, Meera asked each student to write the plotline of the Ramayana in five sentences, in any manner they chose. A couple of students read out their versions and this led to a discussion about the nature of retellings itself. In the next part of the lecture, Dr. Baindur spoke about the diachronic study of an epic as opposed to an episodic study of the same. It was noted that the Ramayana gives importance to specific characters and characterization whereas the Mahabharata focuses on situations and how the characters react to them. She then spoke about the various retellings written in regional texts such as those by Pampa and Kamban. These are examples of how the bhashas assert themselves and make their presence felt by legitimizing their kingdoms, their cultures or their very existence. In particular, this can be the legitimization of a landscape history like Hampi or Jaisalmer or a socio-political problem like the hijra community’s need for political justice. Such usage across time is what can canonize even versions of the epics. After a short break, the final session of the lecture commenced, which comprised mainly of slides with pictures that Meera had taken during her visit to the Angkor Vat temple in Cambodia. The pictures were not only aesthetically pleasing, but were so intricately carved as to have many meta narratives within one mega narrative, if one were to look closely. The session ended with a Pravachana by the speaker, a unique performative tradition where the speaker enacts one incident from the epic and the audience participates with questions and exclamations of anger, sorrow, joy, wonder and so on. Meera chose the incident where Rama asks Lakshmana to leave Sita in the forest and ended her Pravachana with the silent goodbye between Sita and Lakshmana, leaving the students with a sense of awe that comes with the realization that there is so much yet unseen. History, as Benedict Anderson puts it, is the necessary basis of the national narrative. However, the history constructed by the British for the Indians and the one constructed by the Indians for themselves are vastly different and this is where art comes in. Art has always served more than an aesthetic function. It is also a means of expression, of constructing identities and ‘imagined communities’. It is interesting to note how often the British brought to the fore either religious or highly sensuous depictions in art, completely ignoring everything else, constructing India as the promised exotic land – the land of mysteries, of elephants and snake-charmers, of a thousand tongues and even more gods. Theirs was an India where a much married Radha frolicked with an unmarried Krishna, where a Brahma with five heads ruled the heavens from his lotus seat, where kings lived in their forts that were almost magically carved out of stone and where tigers seemed to outnumber men. However, the art created by Rabindranath Tagore and his brothers Abanindranath and Gaganendranath, and others like Raja Ravi Varma resulted in the search and revitalization of representations of Indian cultural history and spirituality, a search that was not expressed through the artistic techniques developed by the foreign rulers, but by reviving indigenous techniques and material. They refused to accept a western way of art and took to integrating Japanese styles and spectacular interplay of light and shade. Even as they were building the nation through their art, they were also revisiting themselves and thereby, in a certain poetic sense, creating another nation – a nation that wasn’t what they saw, but what they hoped it would become. 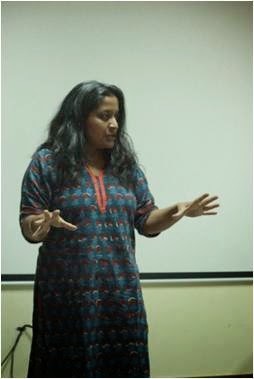 Anupama Madam presented the opportunity of exercising the critical and post colonial learnings of the English Honours class of 2015 and guided them to see how art could be used as a tool for nation building. Overall, it was a very fruitful Saturday where we revisited all our texts except while the texts in our class were made of paper, these were made of clay, canvas and dreams. An ornate culmination, a ruthless history, an eradication of many Alexandrias and the resurrection of power – a power, much benevolent bestowed with the wand to frame the ‘other’ has lurked within our nation. But more than a vehicle that merely lurked, it has shrouded itself against our civilized backs and redefined the structure of equality. Within this very mirage of etiquettes thrust upon our culture by Colonization, much has been gained and much lost too. Dr. Maya from the Sociology department, shed light on a grotesque reality that one was aware of but could not relate to instantly. The almost taxonomic creation of a minority within our democratic nation was highlighted. The idea of a minority being a social construct differentiated and plausibly discriminated by a higher social power gave rise to the term ‘Tribes’ or ‘Adivasi’. Within a series of discussions, the blanket term that defined a heterogeneous community romanticized and exoticized as the indigenous folk thriving by complete isolation from the mainstreams was nullified. Instead, a realm wherein the idea of isolating the other was demeaned not merely through imagination but through statistics and various implementations of reforms for the tribes was unraveled. Much to our disdain, the necessity to look at ourselves as pawns drenched in a colonial hangover became more evident as Dr. Maya pointed out the continued existence of the colonial strategy (The categorizing of people and imparting upon them one’s ideologies). The advent of the British in India, sketched a chronological framework and the curiosity which once crept into their eyes left us indulged too. Though the observers varied across centuries, the subject remained stationary; it was and plausibly will be the ‘Adivasis’. Their so-called ‘peculiar’ culture was analyzed all throughout India and the bridging of the notion of ‘isolation’ was stimulated. Yet the resounding spirit of Jamnalal Bajaj and Jawaharlal Nehru echoed within the four walls of our classroom and spoke for the upliftment of the tribes. Through a trial and error pathway, the implementation of ideas such as the assimilation of tribes by syncing their existence with the mainstream ideologies was looked into. Often hit by a brickbat due to varied professional and religious orientations, a proposal to integrate tribes by creating a support chain for their welfare which not only participated in the establishment of their culture but in the celebration of it was rendered. Still, critics argued that such a proposal would marginalize the tribes as the ‘other’ and hence, once again ‘practise’ Colonization. Unfortunately, the petty condition of the tribes has remained entrapped in an idea of change which has distilled into one of sedimentation. The layering of various problems ranging from basic human rights to the acknowledgement of ethnic identities has piled into a heap; yet one word evokes hope in all -resistance. A word that begins as a dream, lives as an idea but dies down as a fallacy restricted by authorities haunts many tribes. To captivate the surging roar, the Government took many initiatives and a so-called rigorously functioning system was set up yet the development of tribal members is seen to be less than negligible – why?. The most plausible theory of all stands out to be the experience of development being significantly different for an ‘Adivasi’. Examples of the application of reforms which addressed development but not the needs of tribal members were portrayed such as the inculcation of higher education which nurtured the canonical texts but not agricultural difficulties faced by tribal members or even the meager task of the construction of toilets which was implemented next to the kitchen (a holy sanctum to many communities). Further, to create a greater void between the tribes and the Government, corruption flourished and middlemen who were appointed to rejuvenate the welfare of tribes overlooked their activities and often abused them financially. A power embedding an illusion of power to the other chooses to feed on his power and continues to oppress. Such is the case, of the tribes who are bestowed with powers though various acts and reforms yet will always be controlled by the ‘Majority’. Therefore, it resurrects the infamous dichotomy born out of Colonization which merely replaced the British with the Political- Corporate nexus. Through the Forest Rights Act(2006) strives to bludgeon this ugly truth, corruption and the act of implementation to hoard monetary fund’s flourishes as an untamed beast. The idea of a nation built by our very own kind who dreamt of creating a plethora of coexistence which focused on the rejuvenation of each other and the celebration of one’s unique cultures has been stripped off its ideals through the political as well as corporate structure. Much like a shape shifting form that strings out of perception, the majority acting as an angel and the devil, too has marginalized the Tribes to empower yet cunningly devour their existence by covert oppression. As Dr.Maya left the platform with these shaking thoughts, it became obvious that a schism was carved by our own. The necessity to cast these shackles away and bludgeon created stigmas and blurred perceptions echoed within each of us. As a class of the Honours in English studies, graced by the last guest lecture of the semester, Postcolonialism seemed to not merely throb within us but reframe reality within each of our eyes. For today, against chalk powder, scribbled sheets and exhausted pens – a minority within each of us was woken. The possibility of being stepped upon with the excuse of being a minority could be raised in any realm. But much like a rumor crackling to be found and split. We would coexist as a reality refurbishing the ‘Indian dream’ through ‘a voice’ or in our culture through our ‘Zoobaan’. There are some people who sit and talk about the problems which are out there, and then there are some who actually go out and do something about it. The latter are the people the English Department honours us with for our guest lectures. The class of English Honours 2015 started the session on Friday by watching a documentary prepared by Ms. Priya Ramasubban, the guest lecturer for the day. The documentary introduced the class to Kaikondarahalli Lake and the struggles as well as success of the project initiated by a small group of individuals in saving the lake. What really shook the class was the fact that an interdisciplinary group of common people could accomplish so much. More than that, it restored their faith in the government and administrative systems to a large extent, as posing a possible solution seems to go a long way in garnering support instead of just discussing problems. Ms. PriyaRamasubban spoke to the class briefly about her experience in saving the lake. What students really appreciated about Priya was how she could suggest a possible way of countering every problem they posed, as opposed to just a theoretical framework for looking at it in a different way. Priya also told the students that she could get them connected to the local officials if they needed any support and they could always get in touch with her for a discussion or possible strategies. That really struck a chord with them, as it is a common concern if just being sensitized or aware can prompt action, a concern also voiced by Prof. Padmakumar in his classroom discussions, who believes that awareness does not always translate to action. Priya also spoke about how the simplest of thoughts are the starting points for bigger changes, the smallest things which bother or annoy each person can go a long way in changing a situation if one chooses to stay with it long enough. She emphasized how indulging in a little bit of madness everyday should work, and this helped alleviate the common fear that the cause would control one’s life and leave the person too busy for any personal commitments. The lecture was very fun and informal, peppered with humour and intense discussions where the students were made to feel really comfortable with their concerns, no matter how seemingly trivial they might have appeared. The English Department organized a guest talk for the first year English Studies students for the British Literature Paper (EST 131). 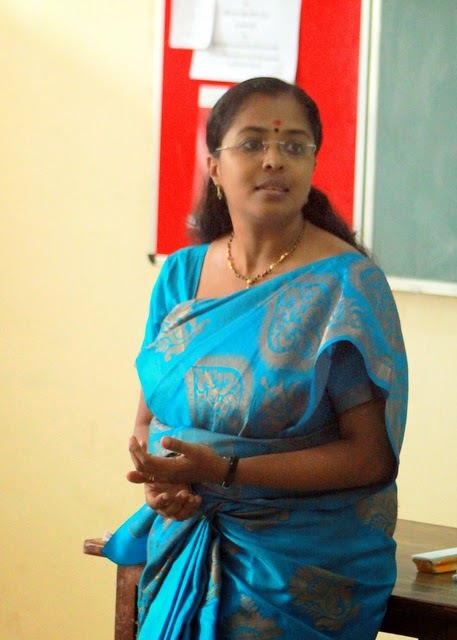 The guest speaker was Mr. Elango, HoD, The American College, Madurai, Tamil Nadu. Being well versed in Shakespearean elements and background, he put forth his theories about how Shakespeare transcends conventional bounds. He dwelt upon various aspects of how cinema was/is influenced by Shakespearean elements. He spoke of some Shakespearean plays and how they catered to all his audiences - from the aristocracy to the groundlings. He talked about the requirements that emerge when it comes to staging a play, as he is a recognized director of Shakespearean plays. He spoke about his innovation on the stage to change sets in 30 seconds without drawing the curtains on the stage with the few resources available. He spoke about each prop being subject to intricate detailing. Interestingly enough, even the production of smoke involves much planning. He also focused on the plots of most Shakespearean plays. Each consisting of a proposition, the climax, and the denouement. The guest speaker spoke about the various aspects of Shakespearean writings such as depth of the characters, importance of time and location, action and reaction, lastly the society in general. He spoke about various Shakespearean stories which have now been adapted and converted to films and how it is important to preserve the essence of Shakespeare in these films. The speaker also allowed questioning the various writings of Shakespeare and made one think about how in a male dominated society where woman were not allowed to act in plays, Shakespearean female leads were still portrayed as strong and powerful women. 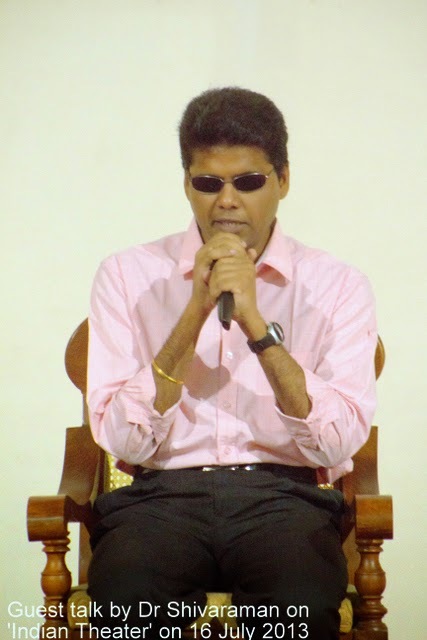 Apart from Shakespearean writing, Mr. Elango also highlighted the various attributes of female characters in his plays such as Portia`s intelligence and quick-wittedness in The Merchant of Venice, the dissimulation and cunningness of Lady MacBeth in MacBeth, the resourceful and realistic nature of Rosalind in As You Like It and many others. He discussed certain important features of a Shakespearean tragedy some of which are: social breakdown or feeling of isolation in the mind of the characters, the play ends with the death of a prominent character, events are inevitable or inescapable and there is usually a central figure who is noble but with a character flaw which leads towards their eventual downfall. As students currently studying the role of Shakespeare in British Literature, this workshop definitely helped increase their knowledge about Shakespeare`s works and enabled them to analyze his writings in a different manner. His speech helped understand Shakespearean literature in simple language and question the role played each character in the society at that time. It has been 450 years since William Shakespeare’s birth, but his saga lives on...and quite literally, at that! 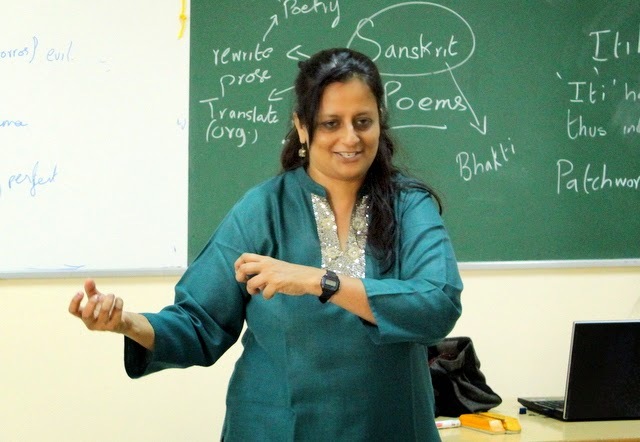 The works of the iconic playwright came alive at Christ University on 13 August 2014, Wednesday, for their annual English Literary Carnival, Jabberwocky. The fest, which is a carnival of sorts, is known for its tidal wave of creativity and fun, but this year saw the exploration of new levels of artistry, with the theme ‘Shakespeare’, in commemoration of his 450th birth anniversary. Indeed, all the University’s a stage - and the students merely players! This year’s topics were some of his classic plays, such as The Tempest, Othello, Macbeth, Twelfth Night, Mid-Summer Night’s Dream, Julius Caesar, The Merchant of Venice, Anthony and Cleopatra, Henry IV, As you like it, Richard II and Romeo and Juliet. Each of the twelve classes had to put up a stall on the play chosen by them and they had to focus on the stagecraft in Shakespeare’s play, Social, Cultural and Historical Context of the play, modern retellings of the play etc . The day was marked by the presence of Chief Guests, Mr Elango, HoD, Department of English, The American College, Madurai and Mr Saad Khan, a filmmaker. They visited each of the stalls, interacted with the students and marked the stalls on Research, Presentation, Interactive games, Conceptualizing and Interpretation and Visualizing.While all the stalls were terrific in their own right, some stalls were the undeniable highlights. Events were conducted through the day for the students. The events conducted were Quiz, Spoof, Card Game, Painting, Costume Parade and Soliloquy. Shakespeare Spoofs was the crowd puller that featured the most rib-tickling spoofs. The Soliloquies were awe-inspiring, with some incredible talents being spotlit. The Costume Parade got the crowd yelling in delight, what with students strutting around, bringing the 16th century to life with their archaic makeover. In all, Jabberwocky was a smashing fete that literally did take literature to the next level this year, by celebrating the legendary playwright in the coolest of ways. With the kind of literary creativity and artistry conjured up this year, the Bard himself would’ve been proud! 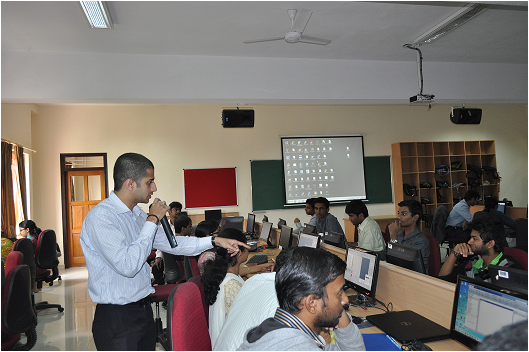 A three day workshop on Cadence OrCAD PCB Suite 16.6 was conducted from 15/07/2014 to 17/07/2014. 50 Students form BTech and MTech were part of it. Workshop started with explaining the importance of PCB designing in today’s world and by learning and experimenting with PCB designs, and how students can become more marketable to companies. It was a vibrant, stimulating, and inspiring workshop and the essence of this workshop is highly valued. 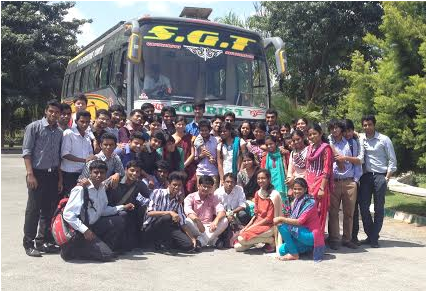 The Department of Electronics and Communication Engineering, Christ University Faculty of Engineering organized a one day Industrial visit to ISRO Satellite centre (ISAC) for the third year BTech and first year MTech students 18th July 2014, and for second year BTech students on 10th September 2014. The Indian Space Research Organization (ISRO) is the primary space agency of India. ISRO is amongst the largest government space agencies in the world. Its primary objective is to advance space technology and use its applications for national benefit. The visit provided an insight to the quality of research happening in the area of space technology and the scope of electronics and communication engineer in this field. It was a good experience for the students which provided exposure about the Indian space Programme and how much they as communication engineers can do in this field. A technical talk on Neuro Marketing was given by Dr. Manikandan Scientist, DRDO. It was conducted on 12/07/2014. Neuro Marketing is a new field of marketing research that studies consumers' sensorimotor, cognitive, and affective response to marketing stimuli. Researchers use technologies such as functional magnetic resonance imaging (fMRI) to measure changes in activity in parts of the brain. Electroencephalography (EEG) and Steady state topography (SST) to measure activity in specific regional spectra of the brain response, and/or sensors to measure changes in one's physiological state, also known as biometrics, including heart rate and respiratory rate, galvanic skin response, to learn why consumers make the decisions they do, and what part of the brain is telling them to do it. Neuro marketing research raised interest for both academic and business side. Operon is an intercollegiate fest organized by the department of Biotechnology, Christ University. The Biotechnology association consists of dynamic teachers and enthusiastic students who took active participation in the fest. The preparations for the fest began in July. Invitations were designed, printed out and distributed among 30 different life-sciences colleges across Bangalore. The students performed a flashmob on 13.8.2014 to promote the fest. Operon 2014 was conducted in the Main Auditorium on August 19. Students from 14 colleges participated in the event. The fest began at 09:30 in the morning with an inaugural dance and lighting of the lamp by Professor NanjeGowda Dean of Sciences; Dr.Louis George, Associate-Dean of Sciences and Prof.Vasantha V.L., faculty Coordinator for Operon. 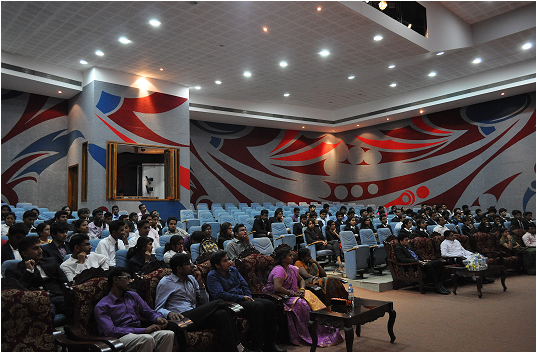 Events like Mind Twister, Marketing Genius and Master-Cracker were all held in the auditorium. Other events like Pot Pourri, Clay Modeling, Synthesizing Shakespeare and Techtooning, were held in Block I. Students from other colleges were extremely enthusiastic to participate in these events. The afternoon session commenced with Quiz organized by Dr Biljo and students of BCB and BCZ. The chief-guest of the day: Dr.Sathyan Menon, Head of HR Division of Biozeen enlightened the students about the various opportunities that were available for them in the field of Biotechnology. This was followed by cultural events and the prize distribution ceremony. Christ University won the overall championship. Being the host college, the overall trophy was presented to the runners-up- Jyothi Nivas College. The event came to a conclusion after the vote of thanks delivered by Dr Suma. S. The active participation of the students and faculty members of the department made this event a successful one.